In the spring of 1934 the Czechoslovak Army Command decided that some Czechoslovak Air Force pilots would participate in the international aerobatic competition Coupe Mondial. For this purpose, the Czechoslovakian aircraft manufacturer Avia was given a task to design and construct an aircraft. Designed by František Novotný as a development of the Avia BH-22, the prototype, B.122 Vosa ("Wasp") was presented after a mere six weeks time, powered by a 260 hp Walter Kastor. The fuselage had a frame of welded steel tube and linen covered. The wings were all wood, the upper and lower wing span the same. On the lower wings were the ailerons. The wheels were attached to the semi-axes split in the tops of the pyramids, including pneumatic oil shock absorbers. The first flight was on May 12, 1934, testing was carried out by Captain Novak. The test results were quite satisfactory, although he considered that the area of ​​the vertical stabilizer should be increased. Twelve days later, the second plane was ready. The Czechoslovak pilots had only a few weeks to learn and master the aircraft as the competition was to be held in July 1934. Luckily, the design was quite successful and the Czechoslovak pilots managed to win the 4th (Novak) and the 8th place(staff-captain Ambrus) in the competition. After that, Novak appeared several times on the new aircraft with demonstration flights in Portugal, Austria, Spain, Romania and Yugoslavia. Afterwards, the aircraft was modified, based on the pilots' inputs, and this resulted in the improved version Ba 122. 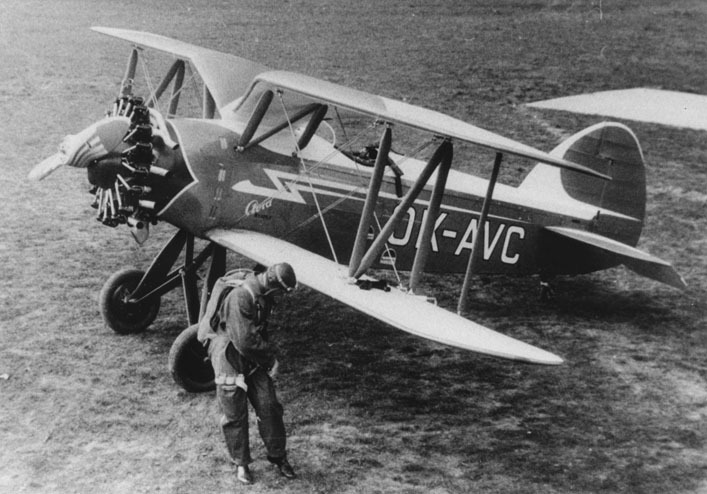 In 1935, the plant produced the first two Avia advanced aircraft modifications Ba-122. It increased the area of ​​the keel and installed a new biplane box. The ailerons were located on the top and on the lower wing connected by rigid rods. The Ba.122 was equipped with a more powerful engine. This version went into production and 35 aircraft were built. The final two B-122 featured a Townend ring but without any advantage they were removed. At the end of 1935 motor improvments went on in parallel on two fronts. One plane put had a Kastor IIA engine with a new carburettor, and another machine mounted a much more powerful 385 hp Air Rk-17 motor. The Avia engine biplane made its first flight 23 January 1936 and tests were successful. The plant began to build in parallel both variants in small batches. The Ministry of Defense ordered 35 biplanes with the Rk-17 to train fighter pilots. One machine with a Kastor IIA was used the German personal air attaché in Czechoslovakia. It was registered on the Czechoslovak civil register. At the Olympic Games 1936, held in Berlin, the program included contests and aviators, Czechoslovakia enrered three pilots - Nowak, Ambrus and Wide. They all received brand new Ba-122. One of them was Kastor powered, and the other two - Rk-17. Broad took the second place, Novak - the third, Ambrus - the eighth. In 1937, Avia powered the Ba-122 with 325 hp Walter Polluk motors. Three of these machines were sent to the International Flying Meeting in Zurich in July/August, along with five aircraft with Rk-17 engines. This allowed two different categories of engines volumes. The individual competition in categories B and C was won by Novak. His colleagues also took third and fourth places. These successes led to export orders from the Soviet Union and Romania. Czech pilots demonstrated three -122s in Moscow on October 15, 1936. The pilots were invited after the Soviet Military Group had paid a visit to the Czechoslovak Republic in summer of the 1936 year. The Soviets ordered fifteen Walter Castor powered A-122 aicraft. A modification of the Ba-122, the B-222, took to the air 31 September 1937. The Rk-17 engine received an elongated NACA hood, and the wheels in a teardrop-shaped fairing. This machine remained the property of Avia and was intended for demonstration purposes. In Czechoslovakia, by this time there was a new version of the Bs-122. The Ministry of Defence has ordered 45 of these aircraft for training units, flight schools and, especially, for the Higher School of aerial acrobatics in Prague. Bs-122 feature a rounded keel and cut-outs in the bottom of the fuselage at the wing to improve visibility downwards. Series tests started on 10 October 1936, completed them in July 1937. All the Bs-122 but one were equipped with Kastor PA engines. One of the planes of this order was a B-322 with Rk-17 engine in a Townend ring and with a closed canopy. The first flight of this machine was made ​​Oct. 24, 1937. For competition in France in 1938, Novak assembled improved B-122, later called the B-422. On it to improve visibility up and down the designer changed the upper wing shape. Two were made, the second an alternate. Both had an Rk-17 engine. The first B-422 went on March 4 and the second on April 7, 1938 to the competition in Saint-Germain. Novak came second. After his return to Czechoslovakia, Novak organized an aerobatic team of nine airmen for various events. At the Munich crisis, all acrobatic planes went into the Air Force. Earlier, they were considered the property of the Czechoslovak Aeroclub, though they were flying military pilots and service technician aerobatic teams Air Force specialists. During the negotiations in Munich, Czechoslovakia was forced to comply with the Germans. In less than a year, the German army occupied the entire territory of Czechoslovakia. The entire fleet of the Czechoslovak Air Force was captured. What exactly the Germans did with the captured B-122 aircraft is unknown. Among the captured equipment included a total of 76 training and acrobatic aircraft. Most of the Ba-122 and Bs-122 were sold to allies of Germany. A number of these biplanes got to Romania. In late 1939, the Germans offered to sell Bulgaria former Czechoslovak Army equipment, including aircraft. At the Merseburg airport a commission of Bulgarian pilots and engineers arrived. They selected a large number of aircraft of various types, including 12 Bs-122. Later, apparently made other purchases, since only the Bulgarian Air Force of 27, including one B-322. In Bulgaria, these planes were called ‘Osa’. The largest number of them operated in 1942-43 at a flight school in Lovech, training fighter pilots. Quite a few aircraft were left in Slovakia, which became an ally of Germany. Slovaks got almost all the equipment of the 3rd Regiment, whose headquarters is located in Bratislava. It is composed of a training squadron, a unit of which were scattered across three different airfields. At the beginning of 1940 were 10 Slovak Air Force Ba-122 and 13 Bs-122. At the end of 1940, the majority of these machines went to a flight school, organized in the town of Trencin-cal Biskupiec. In August 1943, the school moved to the Three Oak airfield. There, they lived almost to the end of the war. In August 1944, the Slovak army, united with the guerrillas, attacked German garrisons. It began a Slovak National Uprising. Part of the Slovak aviation aircraft flew over the front line and sat on Soviet airfields. Others remained in their native land and began supporting rebels from the air. Among them the aircraft on the Three Oak airport. At that time there were three 122 and one Bs-122. Apparently, the machines were destroyed during German air raids. After the conclusion of the agreement on mutual assistance between the USSR and Czechoslovakia in 1935 in the Czechoslovak Army, Soviet commanders were trainees, including pilots. In the summer of 1936 Prague was visited by Soviet aviation delegation headed by the Chief (in a modern commander) Red Army Air Force Army Commander 2nd Rank Ya Alksnis. For her, it organized a flypast, and included a demonstration of individual and group aerobatics airplanes of various types. In response an aviation delegation went to the Soviet Union headed by Lieutenant Colonel Beroun, commander of the 4th Regiment (Czechoslovakia in a small regiments was only five, so Beroun was not the last person in the ranking Air Force). The delegation included the aerobatic team of Novak, Broad, and Hubacheka. Czechoslovakia and the USSR did not have a common border, so flying through Romania, Iasi through to Odessa, the Soviet border was crossed in the parade - in the middle of the three-engine Fokker, and around four Ba-122. The fourth was considered a replacement. And it was needed. Shortly after reaching Soviet territory Novaks motor failed. He made a forced landing in a field. Next to him landed Vyborny. Nowak and Vyborny were guests of the local collective farm, waiting for a new engine from Prague. The rest of the aircraft continued along the planned route. They passed through Odessa, Vinnitsa, Kiev. On the way to the cities, airfields, military units and flight schools group Novak demonstrated aerobatics. The last presentation was given on October 15 in Moscow, at the Tushino airfield. Soviet specialists have noted good handling Ba-122. No Soviet aircraft had the necessary qualities. Even the new UT-1 could not be compared for its aerobatic capabilities. The Czechoslovak delegation returned home from Moscow, but the Red Army Air Force ordered 15 Ba-122. Ten of them had to have Kastor engines, while the remaining five Polluks. Avia fulfilled the order at the end of 1936. In the beginning of next year, all had arrived in the Soviet Union. One aircraft in 1937 was used for state tests in the Air Force Research Institute. One machine with a Kastor engine at TsAGI was studied for the suitability of inverted flight for the Ba-122. He Czechoslovakian biplane could fly upside down for 30 minutes. To this end, it was equipped with a carburetor and fence so gasoline was produced from the center of the tank. The engine had a forced extraction of oil from the top of the crankcase. Most biplanes apparently went into the flight schools and colleges, training pilots of fighter aircraft. Four Ba-122 (two - with Kastor and two with Polluk engines, on March 15, 1940 were in the Odessa aviation school. In the summer of the same year the school was transferred to Konotop. Another plane in the spring of 40, was with the Air Staff of the Kiev military district. The last thing that became clear is the presence of one in the Moscow Glavsevmorputi squadron. She wore a tail number N-261 on February 10, 1942. This was perhaps the last aircraft of this type in the USSR. The aircraft was later further developed into the prototype Ba.422. Total production was approximately 100.